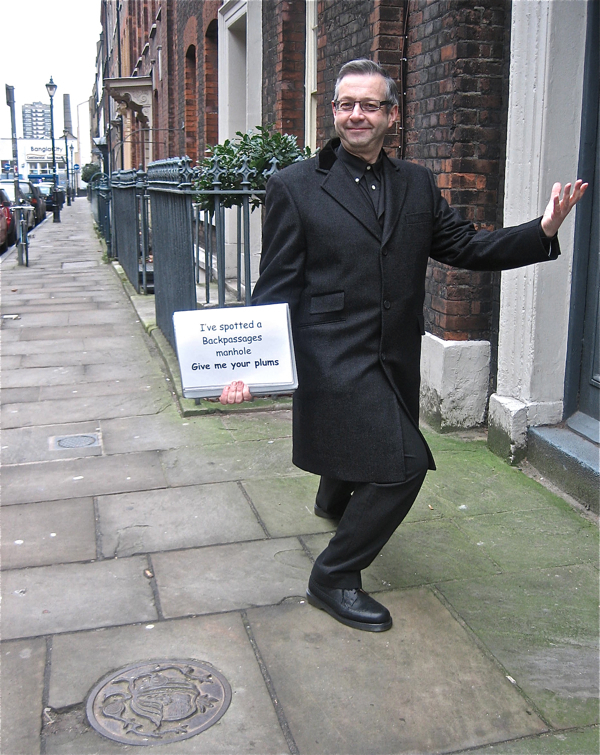 For ten years, Steve Wells & Alan Gilbey gave guided tours of Spitalfields under the uproarious title “The Back Passages of Spitalfields,” renowned for their anarchic comedy and ascerbic social observation. Wearing suits, pulling a shopping trolley full of props and fireworks for impromptu displays, maintaining a constant comic banter, rubbing the Jack the Ripper tours up the wrong way, disappearing down alleys to run ahead and ambush the audience, Steve & Alan were the self-appointed jesters of Spitalfields, and they made the streets and back passages their theatre. Since it was my misfortune to miss these walks the first time around, Alan took me on a personal tour around his old haunts in Spitalfields yesterday, and it was my delight to see the neighbourhood through another’s eyes and learn some new stories. We met outside Liverpool St Station, where I discovered Alan – with an ear-to-ear grin – holding a sign that read, “Yes, this is the Spitalfields Walk.” Once upon a time, two hundred people would gather here in the glory days of the “back passages” tours, but yesterday it was just me and Alan reminiscing. Pointing across Bishopsgate, he explained it was all about the difference between this side of the road (the City of London) and that side of the road (Spitalfields). Walking quickly, Alan vanished down Rose Alley at the side of the police station, and I followed him into a narrow passageway that I had never been in before. “Neither very historic, or atmospheric, or hygienic,” he described it, when we found ourselves in a grimy little courtyard with buildings towering on either side. Yet it illustrated perfectly the contradiction between the wealth and the filth of these two neighbourhoods side by side. Emerging into Petticoat Lane, Alan informed me that this market was originated by the first wave of Jewish immigrants in the medieval period, who were forbidden to trade within the walls of the City. 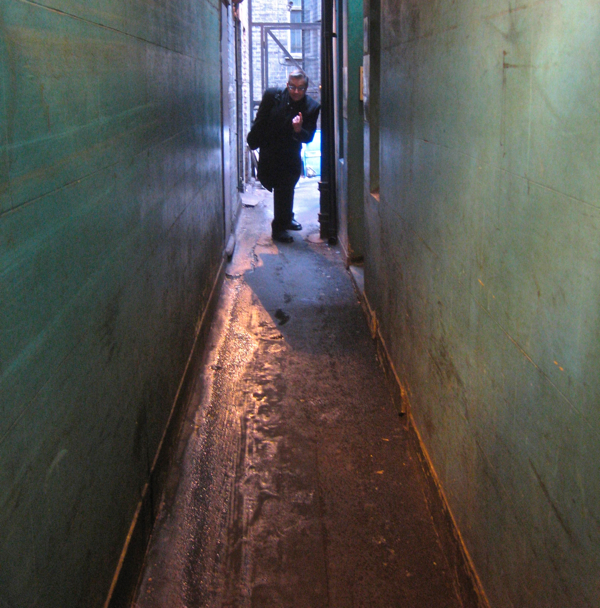 In Artillery Passage, at the heart of what was once a rat warren of houses, Alan paused to quote Dickens’ account of the poverty he discovered here a hundred and fifty years ago. “People can have very set ideas about how history should be told, ” Alan admitted with a good-natured shrug, “We always wanted to be intelligently stupid,” and he quoted the example of a woman who declared,“I am a professional historian and this walk is painful to me.” stomping off to applause from the rest of the audience. Yet Alan & Steve knew what they were talking about, adopting levity and sharp humour to engage an audience, both satirising cliches of East End history through pointing out “Jack the Ripper’s car park,” and dramatising contemporary politics by telling the story of the soon-to-be closed market with fruit & vegetables, which culminated in beating a marrow with a sledgehammer. Not popular with the market security, unsurprisingly. All this was happening through a period of rapid change in Spitalfields, with wranglers required to keep the street alcoholics at bay in the early days and then objections from the well-to-do residents in the later days. Someone with a plummy accent once leaned out of a window in Fournier St to plead with Alan & Steve when the nightly high-jinks became too much. “People have to live here you know!” they appealed, provoking a member of the audience to declare, “I’ll swap with you,” and all the others to join in as well, Spartacus-style, calling “I’ll swap, I’ll swap.” Yet the two jesters persisted in telling the human story of those at the sharp end of social change over the centuries in Spitalfields, and satirising new developments too, even taking their audience to the site of the first cappuccino poured on Brick Lane, at Dray Walk – amongst other historic locations. 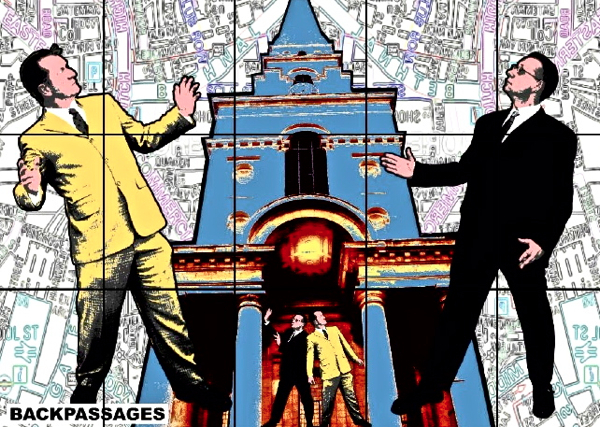 Alan cherishes the memory of when he and Steve found themselves walking in step with Gilbert & George down either side of Fournier St, each besuited couple carried on walking, studiously ignoring the other. Some members of the community chose to become participants though, and Alan delighted to tell me of the growing numbers of Bengali children that would join in the nightly Huguenot battle staged in Puma Court as part of the tour. The walk concluded outside Rosa’s Cafe where Bud Flanagan was born, beside Rossi’s Cafe where the aunt of Francis Rossi out of Status Quo worked. So, with sublime logic, Steve & Alan led the audience in a version of “Underneath the Arches” in the style of Status Quo, before everyone went into the Golden Heart for a reviving drink. 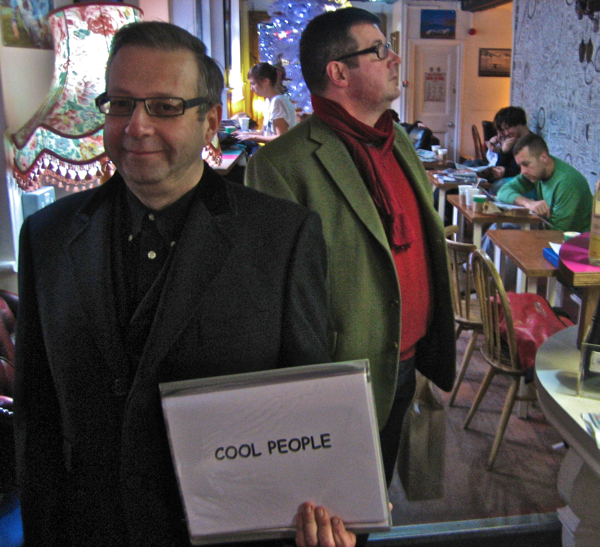 Alan’s background is in the old East End and he was born in Cable St, but he is now a screenwriter and spends his days writing at a laptop in a coffee shop on Brick Lane (writing scripts for the Mutant Ninja Turtles and working on a Pinky & Perky revival), amongst the cool people of the new East End. Yet he used to show photos of his grandmother’s wedding in Juniper St, a slum known as “Incubator St” because people had so many babies, and Alan’s father was a draftsman in an East End biscuit factory. To Alan, the debate about the relationship of the old and new East End is personal, and he can only laugh when he tries to square his family history with his current life and make sense of it all. “I’ve never known an area that so many people wanted to own, as Spitalfields,” confided Alan to me in sprightly amazement, stopping in the street for a moment, and referring to the multiple fictions of history around us, all competing to be the authentic Spitalfields. But our walk – in and out of alleys, and in and out of stories – had demonstrated the constant flux which exists, derived from the meeting of many peoples, that together have created the infinite fascination of this place. 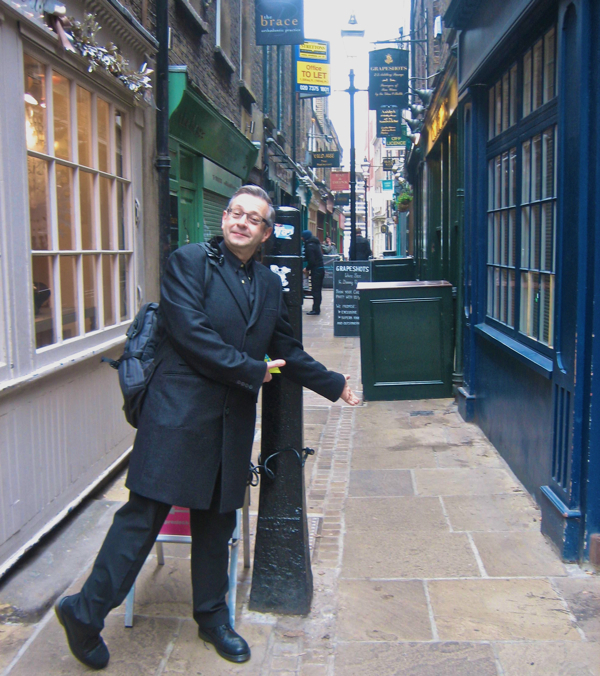 In the footsteps of Charles Dickens and Wilkie Collins in Artillery Passage. Organic plums were offered to members of the audience for spotting Keith Bowler’s Roundels. Having recently happened upon your blog, I’ve been thoroughly enjoying what I’ve read so far. This latest post has me wishing I could book a plane ticket for Blighty right now! Alan sounds like a fascinating character, and this tour seems just the thing for those who prefer their history with a generous sprinkle of irreverent humour. As the page slowly loaded over my ‘narrowband’ service I saw the title and immediately thought ‘Gilbert & George’…and then the graphic appeared and I felt sure my suspicions were confirmed… but then… imitation is indeed the sincerest form of flattery! I worked with Alan and Steve on the very first lot of Backpassages tours and it was great fun. The tour was more basic back then, with myself as researcher and Stage Manager (carrying props around in a car) and a handful of actors who popped up at various places to act out scenes. It showed great promise right from the start and I’m glad it’s still going strong. Is the tour still going strong ? I’d love to sign up for a personal tour or rally some local friends around a visit…Any hope? Many thanks in any case for your fascinating blog where I’m happy to wander, when not wandering around Spitalfields itself which I’m proud to call home. Would you be so kind as to let me know if there any guided tours scheduled for the period 29th July – 3rd August.